We’ve not had much snow lately in North Carolina, but last week we did see a pretty good dusting. Enough to allow me to take Anna over to the park for a short ride down the hill on a sledding tub. I don’t get on a sled much any more, and while I enjoyed the ride, it did bring back a vivid memory and a lesson from my younger days. Now that my parents have both passed on to the next life, I can safely tell this story. Although I expect my mom knew what happened all along, as only mothers can. It was a painful life lesson about looking backwards when you should be focused on where you are going. We did not have continuous snow cover in Kentucky, but when the ground was white, I was probably outside on a sled. One snowy afternoon when I was 15, my friend Wayne (who already had his driver’s license) and I planned a trip to George Rogers Clark Park for a little sledding. We picked up his girlfriend at the time and headed out to the park, bundled up and ready for some fast downhill action. We met some folks at the park that were riding downhill on a car hood. Seemed like a cool idea at the time. It was wide and fast and totally out of control; the perfect draw for a couple of teenagers out for an afternoon of adventure. I do remember thinking that my mom would most certainly not approve of me riding down the hill on the hood of a car. Partly because it was not safe with all the metal edges and mostly because she knew better – I did not. But the parents were not around, we were on an adventure and I hopped on for the ride. The three of us started off down the hill all facing in the right direction. Yes, it was fast and it was fun. Not too far into the ride, we hit a bump, tossing my other two passengers off and spinning me around so I continued down the hill backwards. I was looking back up at Wayne and remember him waving, laughing and yelling. I turned around to look where I was going and a split second later, I made contact with the tree. It stopped me completely. Fortunately, I was wearing several layers of clothing and luckily I impacted the tree about two inches to the right of my spine, dead center in the largest muscle of my back. My head snapped back, but missed the tree. Had I landed a few inches the other way with my spine taking the impact, I probably would not have walked away and might not be writing this post as well. They helped me back up the hill and slid me into the car. It felt like I had cracked something, but I was too scared to go to a doctor. Wayne dropped me off at my house and left quickly before anyone could ask where we had been. I went straight to my room, got in bed, and said my prayers for not ending up in the ER. I never said anything to Mom, but I’m sure she knew something not quite right. I try to look back on these life events and see if I can learn something so I don’t have to go through that pain a second time. For me, I believe this was an example of the value of looking forward when you are going somewhere fast. 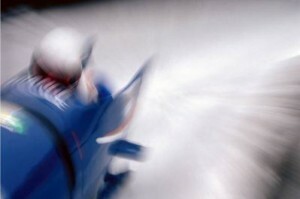 Running a business, in today’s spiraling economic climate, reminds me of my sledding adventure and the importance of staying focused on where you are heading. At Anna’s Gourmet Goodies, we try to do just that. We’ve introduced a new line of packaging with bright colors, are adding some new services for our business clients, and continue to look for ways where we can add value to our existing customers as well as new clients. Debbie and I are shaping some ideas for a new website that we hope to launch shortly. We’re moving forward fast, watching where we are going and not continually looking backwards. In my other business, Master The Gap, we recently migrated our website to a new software platform, changed merchant processing systems, moved to a new email management system and added three new markets to our services. Two of us managed to pull all this together in a little over a week. And just to keep things interesting, my friend and business partner, Scott Andrews, was a featured speaker at four events at Traders Expo in New York, starting just two days after all this went live. It was a new experience for me in moving at light speed with no margin for error. We made a command decision to move forward and did not look back for one minute. Don’t get me wrong – history is important. You have to know where you’ve come from to get a clear sense of where you are going. But, there is a time to look back and be reflective, and a time to look forward. When you are racing down a hill or running a business in a fast changing environment like we have today, you’d better stay focused on where you are headed or you just might hit a tree. Could Lagniappe be a Solution? Last year about this time, a customer and friend, Renee from Uptown Endodontics in New Orleans, introduced me to a new word that has become one of my favorites when I think about Anna’s Gourmet Goodies and our business, ‘lagniappe’ (pronounced lan-yap). It’s Cajun and means, ‘a little something extra’. When we filled one of her large orders last year for their clients, we sent her the same basket to try. No charge – just a little something extra. She thanked us for the lagniappe. We actually love to do this with clients throughout the year. We sometimes send out thank you gifts to our clients in August, at a time when most folks least expect them. And we’ve been known to ‘accidentally drop’ a few extra packs of cookies in someone’s order. It is such a great feeling to do something nice for someone when they are not expecting it. One of my favorite restaurants in Raleigh is The Duck and the Dumpling. Chef David Mao has been a long time customer of ours and if you have the chance to dine there you might just find lagniappe in the form of his delicious carrot ginger soup, or some other culinary surprise before or after your meal. When I step back a few feet and look at our business, that’s really what Anna’s Gourmet Goodies is all about – doing something nice for someone when they are not expecting it. It’s an attitude with which we approach our business and our life. Some of our most successful clients in the automobile, insurance, mortgage, financial services and other industries have embraced this philosophy and made it a part of their business. One of our customers that sends cookies to their employees as birthday gifts and has them delivered to the office on Saturday mornings, recently surveyed their staff about what they liked most about the company and you guessed it, our cookies ranked up there in the top five. Small gesture – big impact. I’ve been thinking about this lately, especially in light of all the negativity of the elections and the economic implosion that dominates virtually every major media outlet. It seems that all we hear about is ‘cutting back’. There is no doubt in my mind that we are in this mess because of greed and excess at all levels of government, business and individual lifestyles, and a little trimming is in order. The focus on ‘what’s in it for me?’ as opposed to ‘what can I do for someone else?’ has definitely tipped the scales to the former. However, could lagniappe be a solution to some of the economic and societal challenges we face? Maybe. I guess it depends, like most anything, on how it is used. From my perspective lagniappe doesn’t mean thinking that if I just put this extra package of cookies in a box, that I immediately expect something in return. It’s not about spending big bucks to impress or bribe people. It’s about doing something nice that brings a smile to someone’s face, to make them feel good – just because. If this sounds a little sappy, stop and think about the last time someone did a little something extra for you and how it made you feel about them and/or the company. Talk about making your business stand out in a crowd – it’s really a ‘no-brainer’. When I see people and companies trying to ‘dig their way out’ of a hole, I’m wondering if the real solution is to stop digging and focus on what you can do to help someone else. In return, you’ll find it easier to take a step up and climb out, when someone inevitably reaches out their hand in turn, to help you. We’re about to enter the season of the year when Anna’s Gourmet Goodies will be busy sending gifts for companies and individuals. I’ve been getting questions from people who pay too much attention to the news, about our business and whether we see everyone cutting back. While we have had a few companies decide to forgo what they consider to be the ‘extras’, I’m also finding just as many new folks that understand the value of lagniappe, calling us with their holiday gift orders. I am certain that at the end of this storm these individuals and companies will be standing on top of the sand dune, rather than being buried with those who focused totally on ‘hunkering down’ to wait it out. I know Renee will understand that while I truly appreciate their business, I am hopefully not in the market any time soon for any endodontic (aka root canal) work. 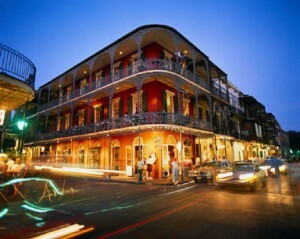 But if I were, it might just be worth a trip down to The Big Easy. I’m absolutely confident that in addition to superior service and a comfortable procedure, there would be lagniappe just for being a patient. And of course, I’d bring along a pocket full of cookies.